This document extended Queensland's control from three miles offshore to 60 miles offshore, bringing all of Torres Strait, to within a few hundred metres of the coast of New Guinea, into the Colony of Queensland. In 1992 this was significant to all of Australia when the Mabo case acknowledged Indigenous land tenure on Murray (Mer) Island in Torres Strait. This judgment overcame the legal doctrine of terra nullius, which had prevented a recognition in law of the Indigenous occupation of Australia. This legislation arose from requests for the lease of islands off the Queensland coast. Before this Act, Queensland had control of all islands within three miles of the coast and New South Wales controlled those beyond this limit. Queensland established a northern government centre at Somerset on Cape York during 1864 (relocated to Thursday Island in 1877). In 1868 the British government extended New South Wales authority to include the granting of mining and occupational leases west of 154 degrees east longitude, to regulate the guano trade on islands on and inside the Great Barrier Reef. In 1871 Queensland's Minister for Lands recommended the colonial government take charge of all islands between three and sixty miles from the coast, to control mineral and guano mining. The aim was to prevent a 'lawless population' controlling these islands, especially in the pearl fisheries of Northern Queensland. The potential revenue from these islands was also an important reason for taking control. In 1872, Letters Patent granted the Governor of Queensland authority over 'all islands within sixty miles from the coast'. This brought much of Torres Strait under Queensland's control, but still excluded important fishing areas around Saibai Island and Darnley (Erub) and Murray (Mer) islands. 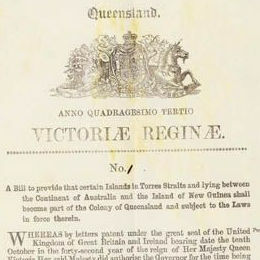 Further Letters Patent, shifting Queensland's maritime border from three miles offshore to 60 miles offshore, were issued on 10 October 1878 and proclaimed in July 1879. This moved the Colony's northern border to within a few hundred metres of the New Guinea mainland, the present-day boundary, including all islands of the Great Barrier Reef and Torres Strait. The provisions of the 1878 Letters Patent were then incorporated into the Queensland Coast Islands Act 1879. The islands brought into Queensland included the Murray Islands, the easternmost islands in the Torres Strait. Mer, or Murray Island, separated from the adjacent islands of Dauar and Waier by a channel about 900 metres, is the largest and most northerly of the Torres Strait islands. Mullins, SP, 'Queensland's Quest for Torres Strait: the delusion of inevitability', Journal of Pacific History, vol. 27, no. 2, 1992. Detail from title page showing the Queensland crest.